Many people from neighboring cities visit Lancaster County simply to purchase the fresh produce that is so common. 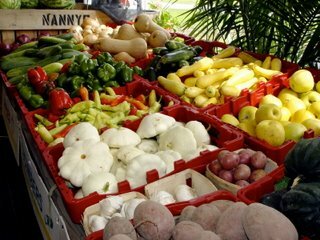 Known as the "Garden Spot of America," Lancaster County is famous for the quality and diversity of its vegetables, fruit, beans, mushrooms and even nuts that are grown by farmers who have lived in the region for many generations. Nowhere is this more on display than at the special farmers' markets and roadside stands that can be found throughout the region. Corn is a common favorite. You can usually get fresh corn from July though October. When buying corn, a general rule of thumb is that the bigger the better. Be sure not to purchase ears where the kernels have an indentation in the top since that tends to indicate that the ears are old and have begun to lose their moisture. Corn tends to come in two basic colors: white and yellow. The most common variety is the white corn known as the Silver Queen. There also exists a hybrid known as Bread and Butter. This variety contains a combination of white and yellow kernels. It is very sweet and tasty. During the growing season, you will see acres of corn growing throughout the region. The stalks can grow up to eight feet tall. While a lot of it is sold fresh, most of it used as animal feed. Another important crop in Lancaster County is the tomato which first reaches the local market towards the end of June. By the middle of July they are omnipresent and the prices are a bit lower. The most popular tomatoes are grown in the Washington Boro which is a small town near Columbia along the Susquehanna River. Lancaster is well-known for its Cabbage which is grown in either the green or red variety. Many unique Pennsylvania Dutch recipes incorporate cabbage into their local delicacies. Peas are also a popular crop. The Sugar Peas tend to reach the marketplace in May while the Hull Peas take a bit longer. Asparagus is mostly seen in the month of May. Broccoli is usually sold during late spring and autumn. Cauliflower, like Broccoli, usually comes out in late spring and autumn. Celery is very popular and is found during most of the year even though there are not many producers. One of the most famous producers is Hodecker Celery Farm, located in East Petersburg, which bleaches their celery to remove the slightly bitter taste and stringiness. You can find this very crisp and sweet celery at Lancaster's Central Market where Hodecker Celery Farm has a regular stand. Although Apples tend to reach the market towards the middle of July, most of the different varieties of apples ripen during the month of October. Lancaster County hosts a number of apple festivals in October such as the Harvest Days at the Landis Valley Museum and the apple Dumpling Festival at the Ephrata Cloister. Strawberries begin to hit the market in June at which time you can attend some of the Strawberry festivals throughout the county. For a little bit of extra fun, some farms let visitors come and pick their own strawberries. Not only can this be fun for the whole family but the strawberries tend to be cheaper than at a regular market. Likewise, you and your family can also pick fresh Cherries at some farms or purchase them the old-fashioned way at the market. In any case, cherry season tends to be very short and is generally limited to the month of June. Peaches come in different varieties. You will be able to find some varieties as early as mid-July while others ripen as late as the end of September. Black Raspberries tend to ripen in late June while Red Raspberries tend to ripen in early July. In addition to the fresh produce discussed above, Lancaster County is a large producer of Mushrooms which are grown indoors and can be found throughout the year. Different varieties of beans including Green Beans, Yellow Beans, and Lima Beans are also a staple in the county and are often served in salads and with corn. Furthermore, you will find a lot of nuts during you visit to Lancaster County. In particular, Chestnuts and Walnuts are grown from tall trees and they begin to fall towards the end of July and the beginning of August. Even though a large amount of the fresh produce in Lancaster County is meant for human consumption, the region is also a large supplier of Alfalfa which is generally used to feed livestock. Soybeans are also plentiful in the area and is used to feed livestock as well as used in a variety of products such as margarine. Finally, tobacco has traditionally been a major cop of Pennsylvania Dutch Country especially to make cigars. However, production has decreased significantly because of the health hazards associated with smoking. While most of the fresh produce grown in Lancaster County can be found in other parts of the country, the rich soil, the heritage of the people and the loving care that is spent have all contributed to the very high quality of what is harvested. In a place where food is a major cultural attraction, it is the simple but fresh produce which is so important. Visit the Farmers Markets, the numerous Pennsylvania Dutch restaurants, the omnipresent Roadside Stands, and the many festivals devoted to these simple vegetables and fruit and you, too, will understand the value of simple but fresh produce.